Games Attended: 1/30/2011 Belmont vs. Stetson, 12/19/2012 vs. South Dakota St. The Curb Event Center has lower oval seating only. The chairback seats are navy blue which plays well with the Bruins team colors. The arena seats 5000 people and provides plenty of standing room only spaces throughout the concourse. The arena has an open concourse concept which provides great sight lines from about 85% of the concourse. The only thing that obscures your view is the eight suites. On the opposite side of the suites is the student section also known as, the MOB. A family friendly section is located behind the basket called Bruiser's Den. Near Brusier's Den they have a balloon that they attach a three to when Belmont makes a three point basket. There are four scoreboards that sit in each corner of the arena. Two of the scoreboards feature video boards. There is a blue light that surrounds the arena's concourse. 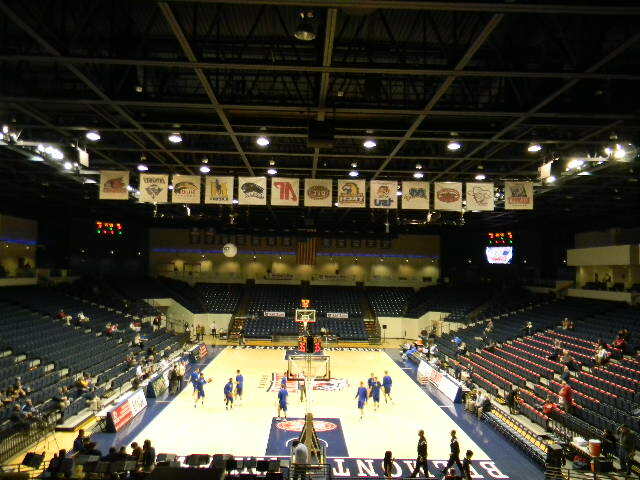 In the rafters you'll see the Bruins NCAA Tournament banners, as well as, other Belmont team banners. On the other side they have the OVC team logos. The ceiling sits pretty low due to the arena only having one level which provides a louder environment. The exterior of the building is primarily brick. There are several different entrances to the arena, but the grand entrance is located off of Belmont Boulevard. An entrance is located near the parking garage, also. The court at the Curb Event Center features the Belmont Bruin logo at mid-court. The inside of the free throw lanes feature navy blue paint and the OVC logo. On the baselines you will see Belmont Bruins and Belmont University. 1. Take advantage of the free parking at the Curb Event Center parking garage. 2. Take a walk around the campus. The campus is walker friendly. 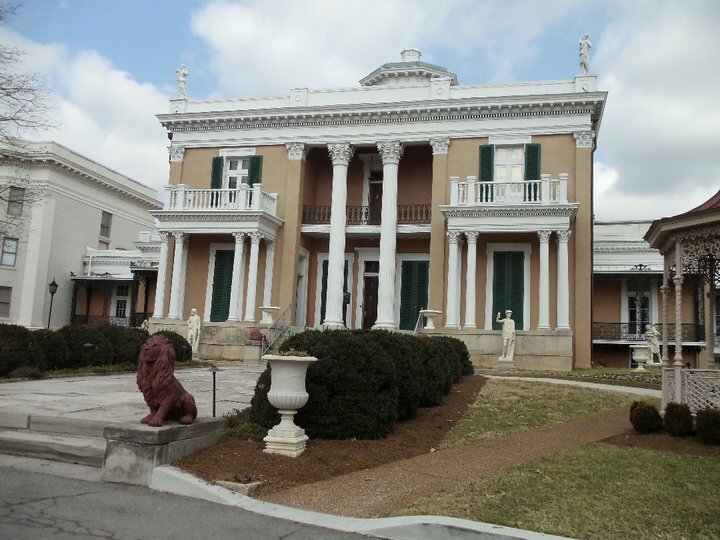 Don't miss the Belmont Mansion and Bell Tower they are must sees. 3. There are several dining options on the out skirts of the campus including PM Sushi/Asian food, 12 South Taproom, Mafiozas pizza/Italian, and Bosco's. I went a little further towards Vanderbilt to eat at Pizza Perfect on my first visit. Also, down the street was the Pancake Pantry, which is a local favorite. If you want to stay on campus try the Curb Cafe. 4. Make it over to the Curb Event Center! 5. After the game if you are looking for bars and live music, head over to Broadway Blvd. the most popular street in Nashville. They have plenty of bars and restaurants that range from local favorites to the Hard Rock. 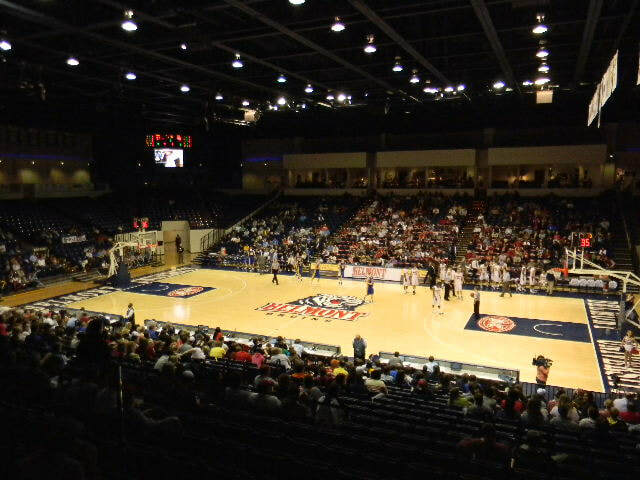 Curb Event Center-I love the open concept of the arena and considering its age this is what I expect in a newer venue. The seats are team colors, which is a plus. Every seat provides a great view and the standing rooms sections provide great sight lines. Parking for the game is easy with a parking garage that's attached to the Curb Event Center and parking is free, yes I said free. The suites are a nice touch, typically with an arena of its size they would be left out. A few things I would change. The suites currently have white walls with Belmont memorabilia hanging on the walls. I would look to spruce them up with a new look, such as, changing the wall colors or painting Belmont logo's inside each one. Another option for the suites would be to add something to the exterior of the suites that are facing the court. A few ideas would be maybe to add retired numbers (if they have any) or feature the Hall of Fame members. On the side facing the concourse I would add large banners featuring current players. Overall Belmont has a great place to call home. Belmont Campus-Belmont is a private university located in Nashville, TN. Belmont is known for their music programs which have produced some of country music's biggest names. The campus has many great features. The first thing that catches your eyes will be the McWhoter Hall which opened in 2010. In front of McWhoter Hall they have a lot of green space which was a soccer field at one point. One of my favorite parts of the campus is the section spanning from the Carillon Belmont's Bell Tower to the Belmont Mansion. The bell tower was the original water tower for the Belmont Mansion and its gardens. On my visit the Carillon was lit red at night. 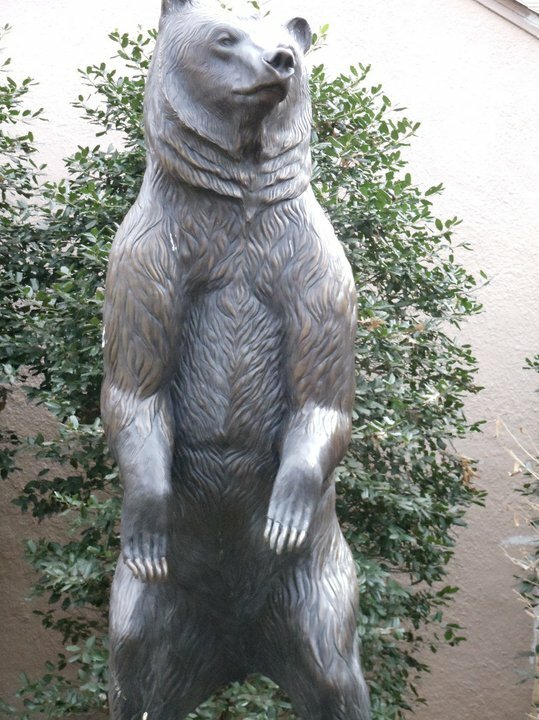 In this portion of campus you'll see plenty of statues including the Bruin statue. The walkway from the Carillon towards the Belmont Mansion features several fountains, statues, and archways. Overall this is great campus with many must see features. Nashville-The city has great food, parks, and entertainment near Belmont. For food try the Pancake Pantry, Rotier's, or several restaurants on Belmont Boulevard by the Curb Event Center. If live music is your thing head to the famed Broadway Boulevard it's just a few miles away. At the end of Broadway, sits river front park which is a nice place to relax. Other cool attractions near campus are Music Row where many country stars have recorded music through the years. Centennial Park is located near Vanderbilt and the parks main feature is the Parthenon. Atmosphere-Whenever a school goes on winter break you never know what the atmosphere will be in an arena. Despite the students being away, the Belmont faithful provide pretty good energy throughout the game. The crowd erupted as the Bruins hit four three point baskets in a row that spurted the Bruins to a blowout win. Overall the Curb Event Center provides a solid atmosphere. Court Design-The court design is very sharp and I would not change anything about it. Whats your rating for the Curb Event Center?